VOIID to play THRASHVILLE alongside FRENZAL RHOMB, KING PARROT, BATPISS and more! Make sure to have your tent set up and drink of choice firm in hand for VOIID’s set this week at the second annual THRASHVILLE MUSIC FESTIVAL in Belford, NSW. 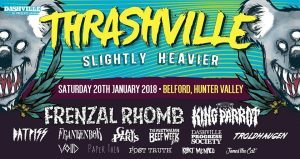 The farm land will gangbusters with the finest punk and heavy australian crop and tickets cheap from https://events.ticketbooth.com.au/event/thrashville2018, so don’t miss out!